This line never gets old in any situation and apparently, it also applies in doing your nails. 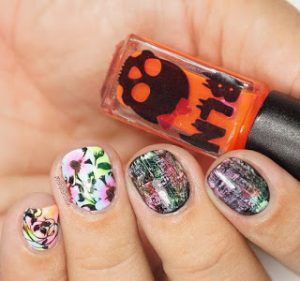 If you want to be good in nail art, you can start by practicing designs and placing stones on something other than your nail—like artificial nail tips or small pieces of paper. Begin by easy beginners design like creating few dots then use a toothpick to pull them all in toward the centre and finish it off with a rhinestone to make it look like a flower. Constant practice will give you great results in the end. 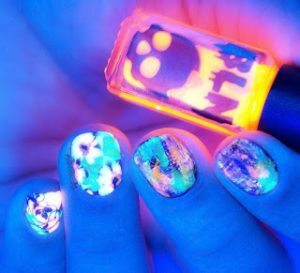 Once you have mastered it, you can try doing it on your own nail or your friend’s. Hey y’all! 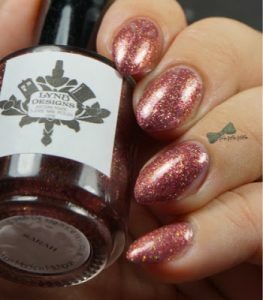 Today on the blog I have some swatches from LynBDesigns to share with you! I’m going to go ahead and spoil the review for you here – these are so good! I usually don’t gravitate towards micro glitters but these all have great formulas and are super blingy and beautiful! 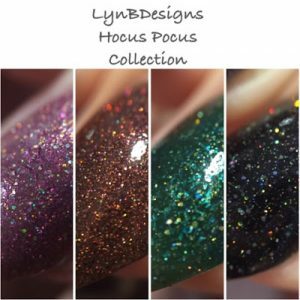 The collection is inspired by the Sanderson sisters from Hocus Pocus which, admittedly, I’ve never seen (don’t stone me!) but I love these nevertheless! The first polish in the collection is Sarah, based on the youngest sister. 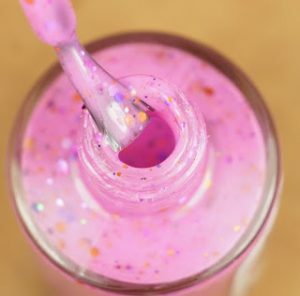 Sarah can best be described as a dense micro glitter in a pink jelly base. The addition of the scattered holo micro glitter in these is what makes them super special, in my opinion! Shown below in 2 coats plus topcoat, these dry to a shiny finish on their own but you guys know I always topcoat! The formula is a bit on the thicker side but I didn’t have any issues getting these to spread across my nail in thin coats. 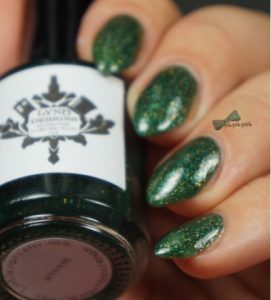 The second polish in the collection is Mary, inspired by the middle Sanderson sister. Okay, so this one was one of my two favorites. Mary is like Thanksgiving in a bottle! 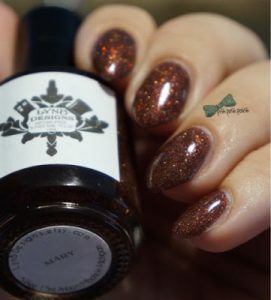 She can best be described as a coppery-brown micro glitter with scattered holo micro glitter in a brown jelly base. I felt like Mary was a touch sheerer than Sarah and wound up doing 3 thin coats, shown below. 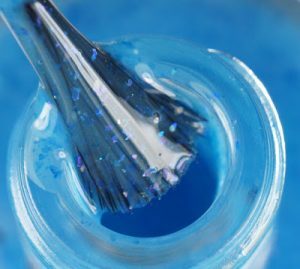 3 coats will not only bring Mary to opacity, but it will also bring the color on your nail to the same depth as the bottle. Same formula as Sarah – thick but easy to do in thin coats, not chunky and a beautiful glitter displacement. The third in the collection is Winnie – inspired by the eldest Sanderson sister. 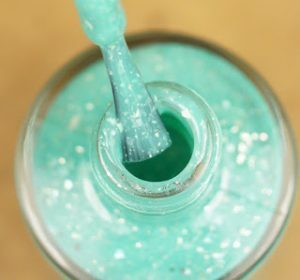 Winnie is best described as a green, teal and yellow micro glitter in a green jelly base. Shown below in 3 thin coats plus topcoat, Winnie felt the sheerest to me of all 4 but deepened to a beautiful forrest green with three coats. Her formula felt more on the jelly side than any of the others, which I loved (I’m a sucker for jellies!) and though the formula was a bit on the thick side I had no issues with application. I love the little flashes of yellowy gold and teal in the midst of the green! 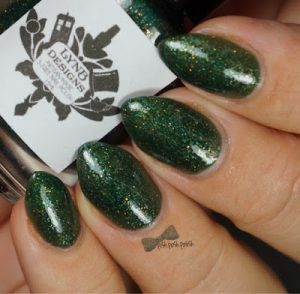 The fourth and final polish in the collection is Thackery – my second favorite! 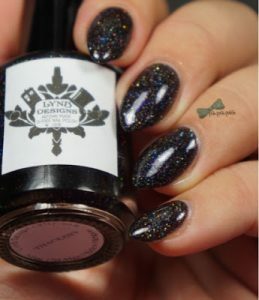 Thackery can best be described as a black micro glitter with holo and purple micro glitter mixed in a black jelly base. 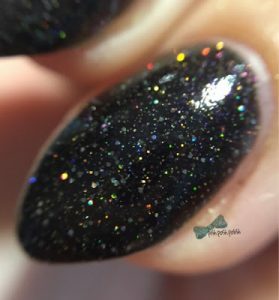 The holo in Thackery is unreal! Its almost like a night sky on your nails. Thackery was more opaque like Sarah and only required two coats for maximum depth and opacity. 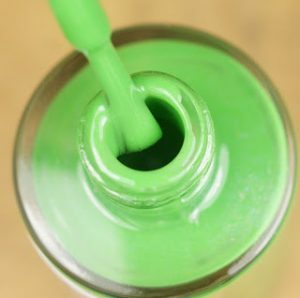 The formula on Thackery is identical to the others, thicker – but easy to control and apply in thin coats. He dries to a glossy finish as well but I did two coats plus topcoat here. So you probably want some details on how to get these pretties, right? They launch as a collection on October 23rd at 7PM EST at www.lynbdesigns.etsy.com. If you buy the three sisters, Sarah, Mary, and Winnie, Thackery comes home to live with you for free! Make sure you follow LynBDesigns on Instagram and Facebook for more news about the launch. If you’d like to see my live swatch and review, click below! Hey y’all! Welcome back! I hope that spring has been lovely to you and that you’re ready for summer because its coming…supposedly. Right now we have been dealing with what feels like nonstop rain which is great for my new flowers but awful for my poor, bored boys who just want to be outside all the time! Here’s hoping that some drier days are ahead! 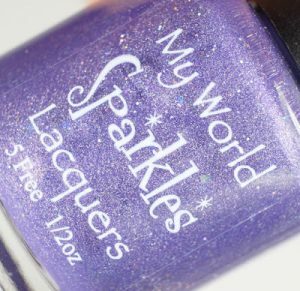 So while its been pouring rain, Elizabeth over at My World Sparkles Lacquers has been pouring us a new collection (see what I did there??) 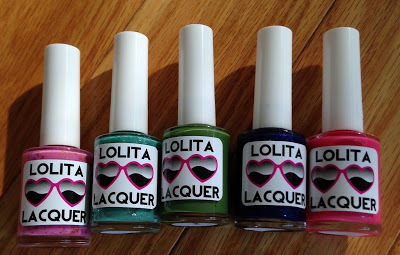 and all of these polishes are inspired by the wonderfully imaginative and somewhat tragic stories of Shakespeare. I think you’ll recognize some of these polish names from excerpts you were forced to try to understand loved to read in high school and college. Shakespeare’s stories are MUCH more enjoyable and easier to understand as an adult than I did as a 16 year old high school student. Amirite? All That Glistens is a black jelly base filled with translucent flakies that show pink, purple, blue, and gold reflects in different lights. The formula was an easy, medium consistency with no lumps or difficulty self leveling. The shreds of glitter all laid flat on my nail and there was no fishing required to get tons of it on my nail. I used 3 coats but it was opaque in 2. I added the third for some extra squishiness and depth. It dries a little flat, but not totally matte so I added a topcoat to make the glitter really shine. 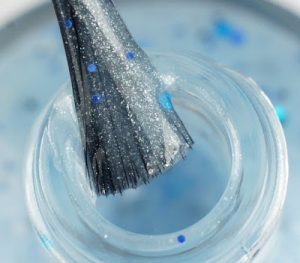 A Winter’s Tale is a frosty white cruelly filled with various sized blue and black glitters with a surprise translucent star glitter here and there. The formula was a little thinner on this one but it was still an easy formula. All of the glitter came out easily with the exception of the large star glitter but there aren’t many in the bottle so I think that was intentional on the maker’s part to only put a few. The stars are also iridescent so they give a little something extra in certain lights. I used 3 coats plus topcoat and still had a slight VNL which I didn’t mind for this one because the shimmery base made it so delicate and ethereal. 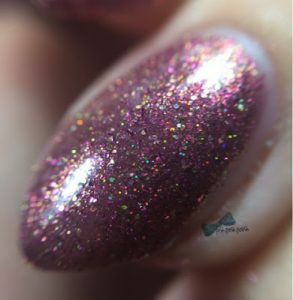 Merchant of Venice is a medium pink jelly base filled with various sizes and shapes of blue, pink, and purple glitters. 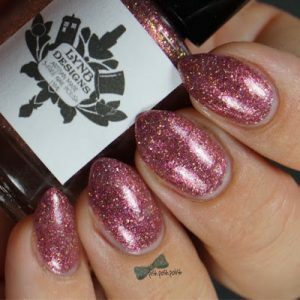 A true, girly glitter bomb, Merchant of Venice was one of my favorites which was a surprise for me because I don’t usually love pink on my nails. I only needed 2 coats to get tons of glitter and to reach opacity. I loved how squishy this one was – the perfect jelly consistency! All of the glitter laid flat on my nail and spread easily with no fishing. I added a topcoat for extra glossiness. 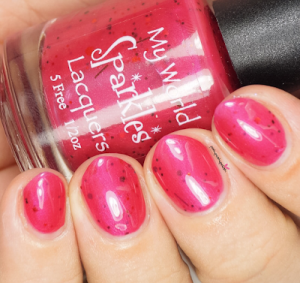 Love is Blind is a red shimmery crelly with bright and dark red hexes and red bar glitter. 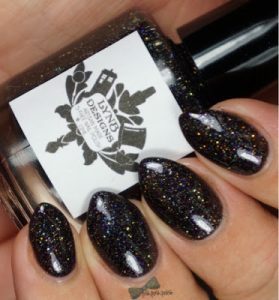 I know what you’re thinking – BAR GLITTER!? Listen, y’all…she took a risk when she added bar glitter. 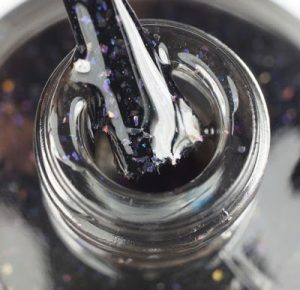 Bar glitter is a dirty word in the nail polish world – you either love it or hate it and most people hate it. I have to be honest…in Love is Blind, I DIDN’T hate it. With the shimmery-ness of the base and the fact that she used it very sparingly, the result wound up being a unique mani that I actually really liked. I used 3 coats of Love is Blind as it was a little on the more sheer side and it gave just enough glitter to feel finished. I added topcoat for extra glossiness here too. 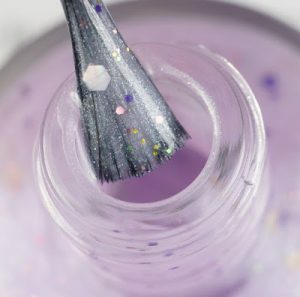 Mid-Summer Night’s Dream is a shimmery lavender crelly with various sized and shaped purple, pink, and gold glitters along with some flower glitter and moon glitter. This one was totally my favorite! I used two coats of Mid-Summer Night’s Dream plus topcoat for a perfectly delicate and feminine mani. The glitter came out relatively easily – even the larger flower and moon glitter. I believe I got two of each without trying super hard to get them out. They all laid nice and smooth on my nail which made the formula on this one very easy and smooth. 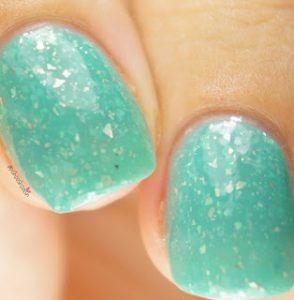 Such Sweet Sorrow is a medium blue crelly with light blue and dark blue iridescent microflakies and glitter. I LOVE THIS ONE! Yes, I’m yelling – ya’ll know blue is my favorite nail color. 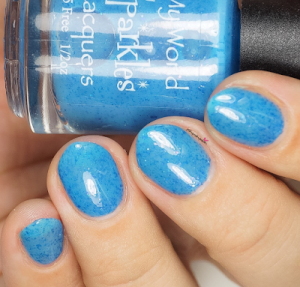 This one looks like the ocean on your nails and the flakies dance across your nail in different lighting. 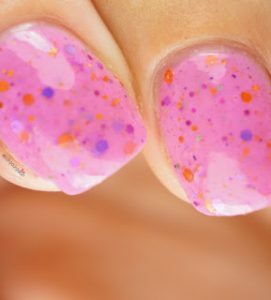 I used 3 coats of Such Sweet Sorrow to reach opacity as it is a little on the sheer side but it built up nicely. The glitter all laid flat on my nail and the formula self leveled well. I added a glossy topcoat at the end as well. Now this brings me to a very important point – are you a part of the Sparkleistas group on Facebook? 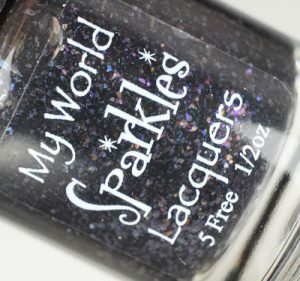 This is the fan group for My World Sparkles Lacquers and its a very good place to be. Why? 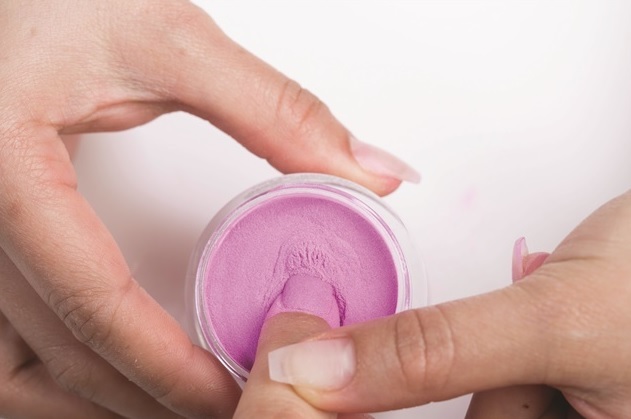 Because we hear about new polishes, see swatches, hear about sales before anyone else! And we get to interact with the maker, Elizabeth regularly. In addition to that, we get to buy special LE group custom shades! YAS. So let me show you our current group custom, Sparkleistas LE 2016. 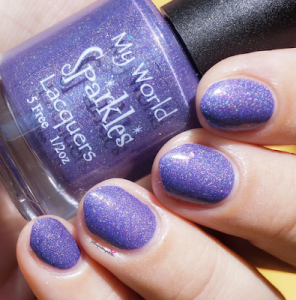 Sparkleistas LE 2016 will only be available to group members (join HERE!). 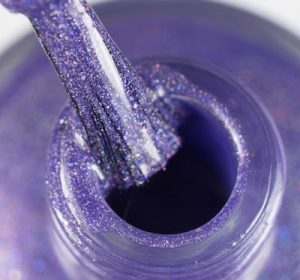 Its a gorgeous medium purple linear holographic polish with silver micro glitter and larger holo glitters. I only needed ONE coat plus topcoat for this mani. It went on super smooth and the larger glitters laid flat with no formula issues. Also don’t forget to check out the Pamper Gems that she offers as well! 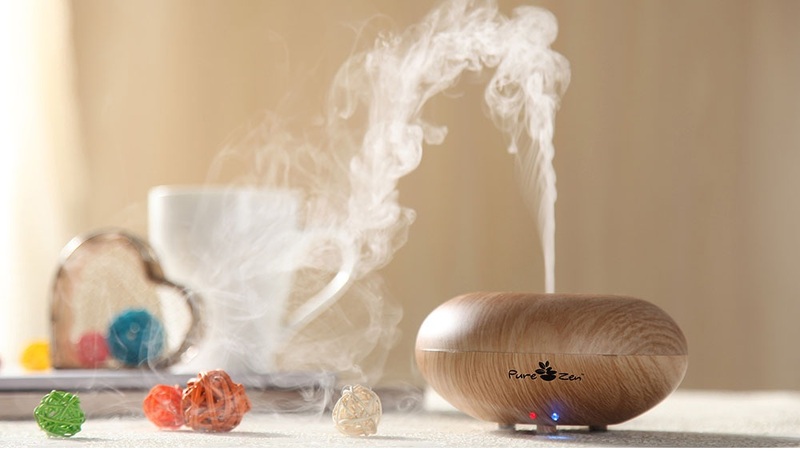 They’re huge so you can get two uses out of them and the scent changes each month! This month’s is called April Showers and has the best fresh, light scent. 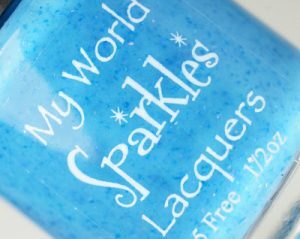 I thoroughly enjoy using the MWS Pamper Gems because they always do wonders for my dry hands and cuticles. They always arrive to me in one piece and not crumbled because she double wraps them. She also includes a list of the ingredients directly on the package. Mine is little crumbled in the photo because my kiddos were trying to convince me that it was theirs. #kids These retail for $1.50 for one, $2.50 for two, or $3.75 for three. 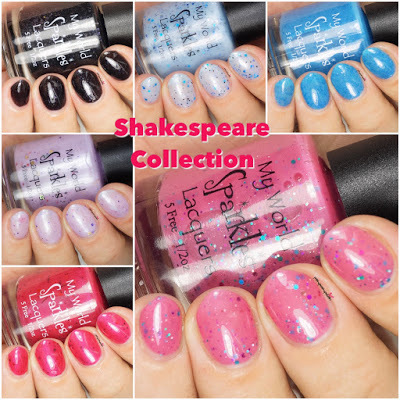 The Shakespeare Collection launched on May 1st and is available now! 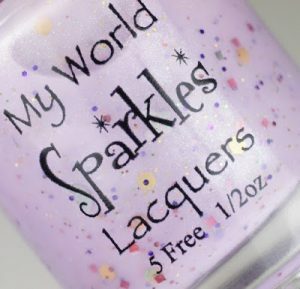 You can get it through the My World Sparkles Lacquer store and if you buy the entire collection, you save $8! 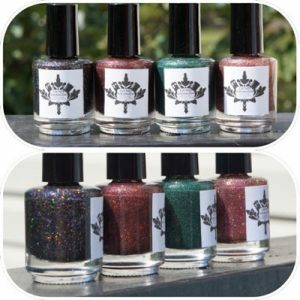 The polishes retail for $8 each or $40 for all six. I have a code for y’all too, PPP10 will save you 10%. 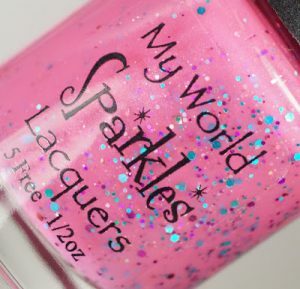 Be sure to follow My World Sparkles on Instagram and Facebook and join our Sparkleistas Facebook group so you can be eligible for the group exclusive polish when it launches. Do you like Shakespeare? Which is your favorite polish? Hey y’all! Welcome back to my neck of the woods. 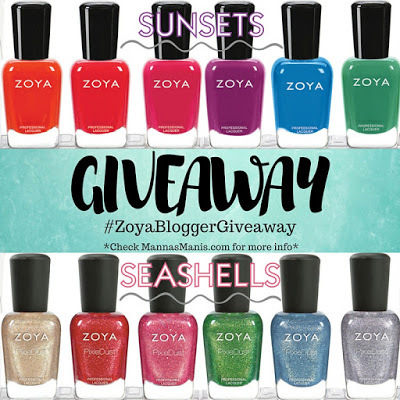 Today I am sharing the link for an awesome giveaway – the entire Zoya Sunsets and Seashells collections! I teamed up with some of my favorite bloggers to bring this to you guys. Special thanks to +Mannas Manis for setting it all up! All you have to do is enter below! 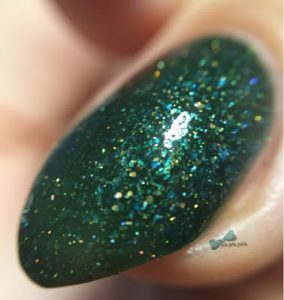 I’ve joined with some of my favorite bloggers to bring you this amazing Zoya giveaway! Hey y’all! 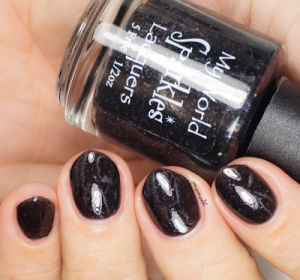 Today on the blog I am sharing the brand new Pop Rocks trio from Black Label Nails with you! 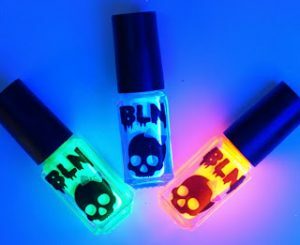 This adorable neon jelly trio is the perfect led lighters trio with a bonus – they are black light activated and glow like crazy! 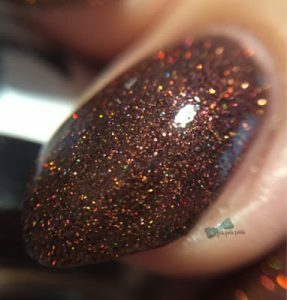 Since these are so very sheer, I do not have traditional swatch photos to share with you, rather some photos of a mani that I did with them so you could see them in action. I also have a live video showing how they work, so make sure you click below to see that. 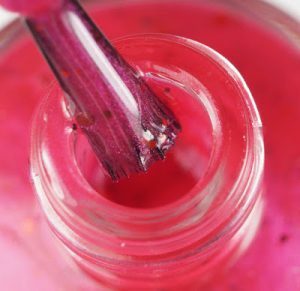 The main technique that these polishes can be used for is led lighting. 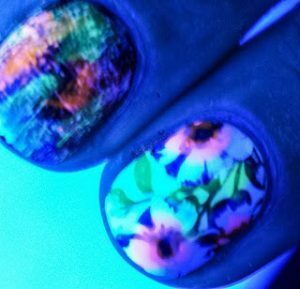 If you’ve never tried led lighting or you’re new to stamping – led lighting is the process used to “color in” stamped images after they’ve been stamped to your nail. Typically you will see this done over a white or silver base (silver holo is fun too!). In my mani, I chose to use a white base since these are neons so that they would pop more. I used UberChic Beauty plate #4-01 and my clear jelly stamper from BornPrettyStore to stamp the floral image on my ring finger. I waited for the stamping to be dry and then topcoated with a quick dry topcoat. Once it was all dry, I went back with the pink, Pop Rocks! Strawberry and filled in close to the flower’s centers. Then I used the blue, Pop Rocks! Tropical Punch and feathered it in with Strawberry to create a gradient effect between the colors. I used the green, Pop Rocks! Green Apple to give the stems some color and fill in the blank spaces between flowers. I used a small detail brush from UberChic Beauty to led light but you can also use a dotting tool. Another technique I did using the Pop Rocks trio is shown on my index and middle finger. I painted my base color black and used a white creme to dry brush over the black. Then I used all three of the jellies to dab color over the dry brush. I just used the brushes inside the polishes themselves to dab the colors over the white. The final technique that I did using the Pop Rocks trio was a squishy marble using all three colors. On my pinkie, I painted a white base and then dabbed a bunch of random dots of color on my nail and went back in with my clear stamper and smooshed them together until they started to blend. I peeled off my liquid latex barrier and topcoated marble. I stamped another image over it in black and topcoated again. I found the Pop Rocks trio very easy to work with for led lighting purposes and found them to be multi functional with other techniques as well. 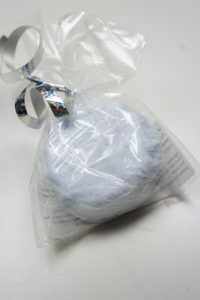 They blend nicely and they’re the perfect sheerness to achieve a nice squishy look. They are also nice and bright and still give the neon effect despite being sheer. If you’re interested in picking this collection up, it launches tomorrow, June 3rd in the Black Label Nails Etsy shop. They will be full size only and retail for $9. Jennifer will be offering a discount for purchases of the trio so if you’re interested in buying all three, email her for more information. You can also follow Black Label Nails on Instagramfor information on future releases! 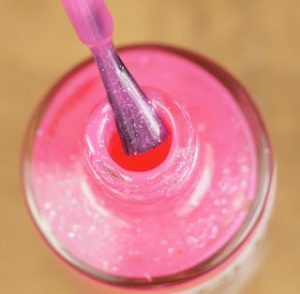 What is your favorite technique to do with jelly polishes?